The original painting, “Keeper’s House, Monhegan, Maine” by Robert Leedy, watercolor on paper, 12 3/4″ x 18 3/4″ which was used for the cover art of “The Miracle on Mohegan Island” by novelist Elizabeth Kelly. I got an email from W.W. Norton & Company a few months ago asking for the licensing rights to an existing painting of mine. Norton is a publishing house in New York and they wanted to use the painting for a book cover – a novel – to be published in May 2016. The painting is “Keeper’s House, Mohegan, Maine” which I painted en plein aire on the island of Monhegan back in 2004. Robert Leedy plein air painting on Monhegan in 2004. Mohegan Island (4 1/2 square miles) lies 12 miles off the coast of Maine and is accessible by ferry. There are roughly 70 year-round residents with lobster fishing and summer tourism being the main sources of income. No cars are allowed on the island except for a handful owned by residents. There are beautiful wooded trails and picturesque, rugged coastlines. Smoking is not allowed outside of the harbor side village due to the risk of fire. During the early 1600’s, the island was a British fishing camp prior to the establishment of the Plymouth Colony on the US Mainland though there are also petroglyphs attributed to either Native Americans or early Norse visitors. Monhegan historically attracts artists; regular artsy visitors or resident painters included George Bellows, Edward Hopper, Rockwell Kent, Robert Henri, N.C. Wyeth, Andrew Wyeth, Jamie Wyeth and more. 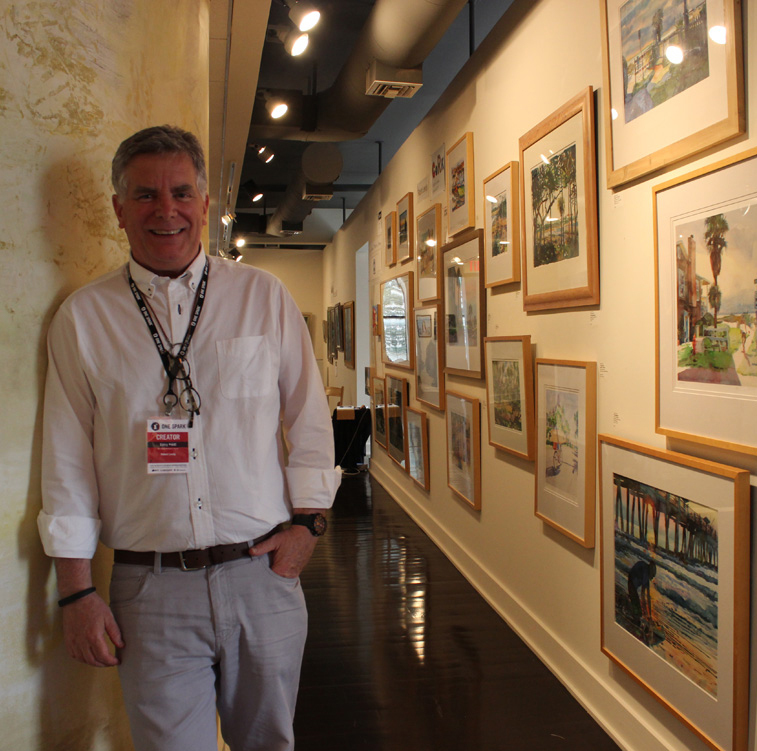 Artists continue to flock to the island during summer season. The story is about a dysfunctional family and Spark’s return to the island – he’s the oldest son looking to reconnect with his 13 year old son he abandoned at age 8 under bad circumstances. Hally is raised by his evangelist grandfather, Pastor Ragnar who leads a cult-like obscure church and is the outspoken, dominant family figure. Spark (let’s cast a Johnny Depp type here) led a life of bad choices and petty crime. Spark’s brother Hugh, an artist and the family cook, also has a big influence in raising Hally. The three generations of males attempt to settle past problems without a female touch as both Hally’s mother and grandmother passed on many years before. Most of the conflict is between Pastor Ragnar and the uninvited, never-lived-up-to-his-standards son, Spark. Brother Hugh attempts to keep things stable while young, intelligent Hally searches for answers within himself and the father he barely knows. The family conflicts peak when Hally claims to witness the Virgin Mary by a seaside cliff. The boy’s apparition ignites the entire community. Maybe the story is vaguely familiar but Elizabeth Kelly’s writing is what locked me into the book. She is witty and creative with lots of dark humor contrasted with a sensitivity to surroundings…but then why don’t we credit Ned, the Shih Tzu Spark steals as a gift for his son on his trip back home? Ned is the book’s narrator. Yes, a dog tells the story and when I first read this, I thought it was going to be guilty pleasured silliness sort of like that detective dog, Chet, in another story. Not so. Dog narration is uplifted to new levels in this book. Ned is a keen observer and witness to all of the conflicts between his new family of humans. His descriptions are vivid while his canine perspective and insights are as fresh as the briny Maine sea breezes. Yes, you could call me a sort of biased, paid cheerleader who loves dogs and wants to see this book go on to great things… like millions of copies sold, tops on the New York Times Bestseller List for 175 weeks, required reading in every American public school, and all of those never ending book awards…but it really is a good read and I am now a big fan of Elizabeth Kelly. Check it out. Leedy’s original watercolor, “Keeper’s House, Monhegan, Maine” is available for purchase. You can find it on his web site here.